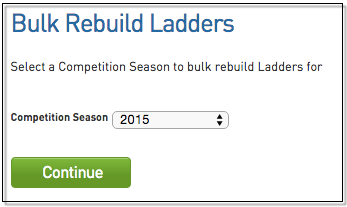 The Bulk Ladder Rebuild menu will give you the functionality to refresh the ladder data for the competitions in your database. This process will only need to be used if the ladder data in your database and the ladders displaying on your website aren’t matching up, even after a Publish to Web. The Bulk Ladder Rebuild can be done by a Competition Season. Processing a Publish to Web after completing a Bulk Ladder Rebuild should refresh and update the Ladder data on your website. The following can only be completed at association level. 2. Select the season to bulk rebuild and click Continue. 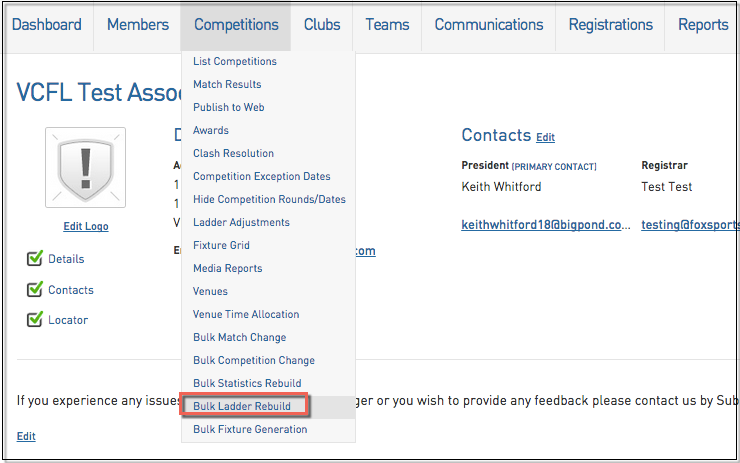 3.The below is an example showing that the competitions have been placed in the process log.